…I wrote about some cars expected in the next 12 months. These cars only scratch the surface of what's listed at the Plug-in America Vehicle Tracker site. Not all of the cars listed are actually highway safe. Not all of them can get 80 mi on 80% charge Not all of them are priced below $33,000 Not all of them are coming out in 2011 or 2012. Not all cars are even listed. And certainly not all of them are even standard, consumer-level cars. But it's a start, and a good start as we learn more about the electric driving future that shall inevitably arrive. So here too is to two more year and another 119 cars! …I wrote about some of the Electric Vehicles available today. In just the last year, a number of cars have been announced with varying levels of fanfare, most of which targeting a 2011 or early 2012 release. Many of these are listed on the Plug-in America Vehicle Tracker, and others are too new for even that list. I first learned about the plans for an electric Ford Focus in late 2010, mentioning it as early as my And when problems with the LEAF were announced in early December, I became very keen to find out as much as I could about this potential LEAF competitor. A Tesla as a family car, I first mentioned the Model S indirectly in my EVSE installation post. With the highest upgrade boasting a range of 300 mi (483 km), this isn't just a work-and-back-again car; it can really take you places, if you're willing to pay. But that range-extended upgrade is currently price unknown and for that $57,400 Plug-in America lists, all you get is 160 mi (257 km). Still, it's a very beautiful car and if I had $5,000 to spare I know I'd reserve one today! Just when you thought Toyota had forgotten how to make an EV, they're back with an all-new, redesigned with a Tesla drive train, Rav4 EV 2012! I've yet to talk much about the 2012 Rav4 EV but I have seen it and I'm very excited! I first learned about the Ford Transit-Connect EV when researching the Focus Electric. I have notes from the big announcement at that time that I've yet to transcribe onto this blog. Then again, if I had I dime for every post I intended to make but never have time to get around to, I'd be a professional blogger by now! The Transit-Connect is more of a delivery van than a commuter car, so it's not really an Affordable Electric Car so much as an Affordable Electric Truck; but I'll leave someone else to write that blog. I've mentioned the C-Max Energi in a post about the Focus Electric, but then dedicated a post of its own to this PHEV and a wholehearted recommendation for a blog about it written by a friend of mine who recently received his very own Nissan LEAF. I mentioned both of these cars in the Ford Focus Electric post as a counterpoint to an established, American automotive corporation. Both are built in China and both worry me a great deal in terms of safety because of this.&nbps; It's not that China isn't a country full of skilled laborers, but in a country that would put lead in its toys and poison its milk, I just don't want to trust my life to one of their cars. The Inizio, and indeed all of Li-ion Motors cars are missing from the Plug-in America site. But, I did see this car back in January and even interviewed a representitive from Li-ion Motors that I hope to bring to you in the near future and I look forward to learning more about their future Liv line of vehicles. …I looked back at my first post. Since that first post, I've added a number of cars to this blog; some mentioned occasionally, some quite frequently. All of these up and coming or already arrived cars deserve a mention since they're all at least partially able to take the label of Affordable Electric Car and all but one mentioned in the Plug-in America Vehicle Tracker. I first mentioned the Volt in my second post to this blog, back when it was still designed with 60 mi (97 km) range. I've no doubt has a love / hate relationship with the Volt over the last 2 years, but don't get me wrong, the Volt is the right car for a lot of people, and anyone interested in an EV with a 40 mi (64 km) round trip daily commute should seriously consider this car. I even know a place where you can get the Volt at MSRP! I haven't spoken much about the Mini-E — so far only in my EVSE installation post — but this car has been on my mind a long, long time. When the leases were announced for 2009, I jumped on the chance to get one of the 500 East Coast orders. But alas, my region wasn't one of the privileged ones, so there was no Mini-E for me. On the bright side, at least I saved over $800 per month for the last 2 years! The holy grail, as it were, of the PHEV world is the Plug-in Prius. For years, home hobbyists were converting their Toyota Priuses into Plug-in cars to take advantage of inexpensive electrical rates. I first mentioned the Original Equipment Manufactured (OEM) Plug-in Prius in January and was much enthralled. It may not be the EV of my dreams, but it's about bloody well time! If you're a regular reader of this blog, you know it's not a question of what I have said about the Nissan LEAF, it's a question of what I haven't! I first signed up on the mailing list for the LEAF in February 2010, and have been following it ever since. Indeed, my first mention of the LEAF was as early as May 2010 in a massive post about the physics of fuel economy. Although Plug-in America's database is quite thorough, there are some very important cars that have yet to make their list. Nowhere is this more apparent than with the Smart Electric Drive, which I first mentioned to you back in January when I saw the first car ever leased in North America. It was two years ago today that I began this blog with 4 cars I suggested we watch to be the first Affordable Electric Car to market. Oh, how the landscape has changed in these brief 2 years, and how much I've learned in the process. Not the least of which of all I've come to know in the world of the Electric Car is the table kept by the Plugin America organization. Plug-in America's Plug-In Vehicle Tracker is the most definitive list of Battery Electric Vehicles (BEVs) and Plug-in Hybrid Electric Vehicles (PHEVs). With 119 cars, trucks and bikes currently listed, the future looks bright for the EV revolution. In the next few posts I'll be bringing you an abbreviated survey of what was, what is and what will be in the world of the electric car. This is but a small sample of all the cars listed at the Plug-in America site; I've tried to enumerate some of the most important or interesting cars but you can find a complete list by visiting the site. It's well worth a look. The Mid Atlantic, New York and New England: Now's your chance to Test Drive a Nissan LEAF! Sign up to test drive the Nissan LEAF from Friday 18 March to Sunday 20 March at the National Harbor in Maryland. You can get to the national harbor via I495 toward I295. Keep left and follow the signs to the National Harbor. The National Harbor is all new constructions with a large hotel, shopping and dining. I'll be there at opening to get my test drive. Will I see you? Labels: National Harbor, Nissan Leaf, Test Drive, Virginia, Washington D.C. 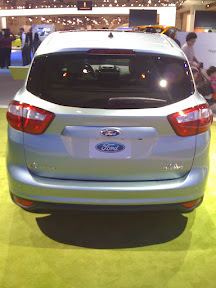 The C-Max Energi is the next generation of Ford's C-Max line. It's a Plugin Hybrid (PHEV) that can go en estimated 500 mi (800 km) on a full charge and a full tank of gas, meaning that it's the perfect fit for daily driving on mostly electric with a range extension allowing it to go half-way up the eastern seaboard on a single tank of fuel. And of course, as a hybrid, it can still fill up at any of the thousands of petrol stations across the country. How far can the C-Energi Max go on electricity alone? That's an excellent question to which we don't yet have an answer. My friend EVNow from the My Nissan LEAF forum has calculated an estimated electric range of between 30-40 miles, which would put it at slightly more than the Chevy Volt, no doubt due to the C-Max Energi's larger size being able to accommodate a bit larger battery. And the plug for the C-Max Energy is conveniently placed next to the driver's side door so it can be quickly hooked up to an EVSE for charging. This paradigm, first introduced to me by EVNow, allows a two-car family to never use petroleum for their weekly travel needs, relying on gasoline only for those rare trips out of town to visit grandma and the like. The BEV can be used by the daily commuter who travels under 80 miles (128 km) round-trip per day. The PHEV can then be used by the other household driver who either has a shorter commute to work (say 30-40 miles, round-trip), or to run errands around town. And, unlike the Ford Focus Electric, the Ford C-Max Energi has ample storage space in the rear via its easy to load hack-back. One of the problems with a BEV is that you need to keep the weight down, which means most highway compatible EVs can only accommodate 4 passengers comfortably. These cars make for ideal commuting to and from work, or even for limited carpooling. However, the C-Max Energi, being a PHEV, is also built to transport the neighborhood kids to soccer practice or to take the entire family on an extended trip. This is because, unlike the Chevy Volt, the C-Max Energi's larger body easily holds 5 passengers. For more information on the C-Max Energy, you could do no better than reading my friend EVNow's C-Max Energi blog, or follow him on Twitter. The Electric Vehicle Service Equipment (EVSE) Tax Credit, as it's sometimes referred, is actually not called that for the purposes of tax law. As people file their 2010 taxes, they are finding out that this credit is actually covered on IRS Form 8911: Alternative Fuel Vehicle Refueling Property Credit. Despite its misleading name and repeated references to Hydrogen refueling, this is the form you should file if you installed an EVSE in your home in 2010 for the purposes of charging an electric vehicle and plan to take the credit — of course, why else would you put an EVSE in your home except to charge an electric vehicle, but technically that's all it's allowed to be used for. Line 1(b): Enter the total cost of the EVSE install (Including parts and hired labor). Lines 2-11: Ignore (unless you installed the EVSE as part of a business). Line 12(b): Copy Line 1(b). Line 13(b): Do nothing; the value of this line is 0.50 or 50%. Line 14(b): Line 12(b) × Line 13(b) (i.e. Line 12(b) × 0.50). Line 16(b): Line 14(b) < Line 15(b) ? Line 14(b) : Line 15(b), i.e. the minimum of Line 14(b) and Line 15(b). Line 18: Copy Form 1040, Line 44 or Form 1040NR, Line 42 (Nonresident Alien — people living in the U.S. that are not U.S. Citizens nor in possession of a Green Card; typically this is if you're in the U.S. on a work or student visa) or your regular tax before credits. Line 19a: Enter $0 (unless you have some overseas credit to add). Enter the total, if any, credits from Form 1040, lines 48 through 52 (or Form 1040NR, lines 46 through 49 for Nonresident Aliens); Form 8396, line 9; Form 8859, line 3; Form 8834, line 22; Form 8910, line 21; Form 8936, line 14; and Schedule R, line 22. The thing to note here from an environmental perspective is that your are calculating your taxes after all energy-efficiency, energy-generation and electric vehicle credits. This means that if you declare one or more of these credits in the same year as you try to declare the EVSE credit, it's possible you may be disallowed from the EVSE credit due to the Alternative Minimum Tax (AMT). Interestingly, the way Form 5695 is written, you have the same problem with the energy-efficiency and energy-generation credits with the electric vehicle credit: if you try to declare both, you may end up not getting the energy-efficiency and energy-generation credits due to AMT. Line 19c: Copy Form 8834, Line 29. This is the other half of Form 8834, the Qualified Plug-in Electric and Electric Vehicle Credit for originally built 2- or 3-wheeled vehicles or city-cars limited to low speeds, but applies this time to the value for the credit carried over from previous tax years. Line 21: Copy Form 6251, Line 33, Alternative Minimum Tax—Individuals. Notice here that the AMT is calculated before any of your credits have been applied. Line 22: Subtract Line 21 from Line 20 (Line 20 - Line 21: difference between your regular tax with credits and AMT before credits). Stop if Line 22 < 0! Copy Line 23 to Form 1040, Line 53 or Form 1040NR, Line 50 (Nonresident Aliens), as applicable. The main thing to take away here is that many people who bought an electric vehicle in 2010 and who file Form 8936 for the $7,500 credit and also installed an EVSE in their home may not be able to get the EVSE tax credit because Form 8911 compares your regular tax after credits to your AMT before credits even though you can declare the Qualified Plug-in Electric Drive Motor Vehicle Credit regardless of AMT. Since most people who buy qualified electric motor vehicles also bought an EVSE in the same year, many people are going to be denied this credit in the one year they would be using it. This is truly unfortunate in my opinion, though I, personally, consider myself eminently fortunate for having installed my EVSE in 2010, before I could buy my EV. At the time of this writing, Turbo Tax is taking the rather idiotic position that most people won't be filing Form 8911 in 2010. In the same year when electric vehicles went mainstream, Turbo Tax thinks that people aren't going to install the equipment specifically created to service them? Are they insane? I would encourage all my readers to file a request with Turbo Tax to convince them that Form 8911 is highly relevant to the 2010 tax year and they should add it to the program at the soonest possible update. Without this update, users taking the credit won't be able to e-file their returns, making this program practically useless since all forms will need to be filled out by hand anyway without the ability to e-file. To try the Online Chat, click on Chat with Us; to try to speak to Turbo Tax on the phone, click on Call Us. Note the estimated wait time listed above the Chat with Us. I need Form 8911 to file my taxes but you don't have it installed; please add this form so that I can e-file my taxes. Enter your First Name, Last Name and E-mail Address, the last one twice if necessary, into the boxes provided. Click Chat Now or Get Phone Number button. If you selected Chat, a window will pop up where you can describe the problem in more detail with a Turbo Tax agent and express your desire for them to add this form to the program. If you selected Phone, a page will open with a phone number and a reference number. Dial the number on your phone and then enter the reference number when prompted. When you get through, describe the problem in more detail with the Turbo Tax agent and express your desire for them to add this form to the program. What laws govern the EVSE Tax Credit? The EVSE Tax Credit is covered in Title 26, Subtitle A, Chapter 1, Subchapter A, Part IV, Subpart B, Section 30C of the U.S. legal code. Paragraph (a) sets the base credit at 30% of the cost for the EVSE, Paragraph (b)(2) limits the credit to $1,000 for individuals and Paragraph (c)(2)(C) specifics that EVSE qualifies for it: Electricity. Paragraph (d)(2) is the part where regular tax with credits is compared to AMT before credits, causing all the unhappiness mentioned above. Of course, in 2010, you were able to declare 50% of the value up to $2,000; this comes from Section (e)(6) which adds an exception for EVSEs installed in calendar years 2009 and 2010. Specifically, Section (e)(6)(A)(i) is what sets the limit to 50% and Section (e)(6)(A)(iii) is what sets the maximum to $2,000. Finally, Section (g)(2) sets this tax credit for EVSEs to expire on 31 December 2010… or at least, that was the case until 17 December 2010. Extension of Credit.—Paragraph (2) of section 30C(g) is amended by striking ‘‘December 31, 2010’’ and inserting ‘‘December 31, 2011.’’. Effective Date.—The amendment made by this section shall apply to property placed in service after December 31, 2010. In other words, as of 1 January 2011, Section (g)(2) now allows this credit under the prior 30% / $1,000 rules for EVSEs placed in service in calendar year 2011. Technically, the EVSE credit wasn't reduced. The 50% / $2,000 limits were specific adjustments to the 2009 and 2010 tax years. As of 2011, we go back to the old limits of 30% / $1,000 maximum. Not the best of options, but at least the credit was extended. In the current session of the Maryland Senate there are three important bills which will effect EV drivers in the state. At this month's EVA/DC public meeting, group vice-present, the extremely affable Charlie Garlow brought to my attention these bills and as we both support these issue, with his permission I am reproducing them here. As I don't actually live in Maryland I don't have a state Delegate or Senator in the Maryland General Assembly, I don't have anyone in the legislative branch to whom I can write, but I'd be happy to address letters of this nature to the Governor's office as a concerned citizen of a neighboring state, but as he proposed these bills, I'd just be preaching to the choir. I would encourage anyone in the state of Maryland to look up your Delegate and Senator and send them a letter like the ones below to encourage them to pass laws that will keep Maryland green! Requiring the Public Service Commission to establish a pilot program for charging electric vehicles by June 30, 2013; authorizing an electric company to request to participate in the pilot program; requiring the pilot program to include incentives for residential, commercial, and governmental customers to recharge electric vehicles in ways that will accomplish specified goals; and requiring the Commission to report to the Governor and the General Assembly on the program by February 1, 2015. Of these, PEPCO and BG&E are the biggest. This bill would act similarly to the Dominion Virginia Power EV pilot program in that it would establish special billing rates for a limited number of homes with electric vehicles. It would then monitory electricity usage by these homes in order to establish a long-term resource requirements as the number of homes with electric vehicles increases within the state. As of 17 February, the bill has passed the Maryland Senate on its third reading but has yet to be taken up by the Maryland House of Delegates. The text of the bill can be found here. Establishing the Maryland Electric Vehicle Infrastructure Council; specifying the membership and staffing of the Council; requiring the Governor to designate the chair or cochairs of the Council; prohibiting members of the Council from receiving specified compensation, but authorizing the reimbursement of specified expenses; requiring the Council to submit an interim and a final report by specified dates; defining terms; etc. This bill would establish a commission to investigate the needs of the state of Maryland in support of an increasing Electric Vehicle population in the state. The main focus will be to establish public Electric Vehicle Service Equipment (EVSE) stations at locations convenient for on-the-go charging. The establishment of such a panel will go far to mollify the fallacy of range anxiety. What's more, there's a good chance my friend Charlie could be appointed to this committee, and as vice-president of the EVSE he's well-versed about the needs of electric vehicle owners on Maryland. As of this post, this bill is stuck in the Maryland Senate Finance Committee since 26 January. Sending letters to both your state Senators and state Delegates will go a long way to moving this bill through the general assembly. The text of the bill can be found here. Allowing a State income tax credit for tax years 2011, 2012, and 2013 only, for 20% of the cost of qualified electric vehicle recharging equipment placed in service by a taxpayer during a taxable year; providing for administration of the tax credit by the Maryland Energy Administration; limiting the credit to taxpayers receiving initial tax credits from the Administration; limiting the tax credit to $400 for each individual recharging system; etc. This bill has piqued the most interest for me personally. When the EVSE Tax Credit was extended in 2010, it was restored to its pre-2009 levels of 30%, $1,000 max. This meant that, effectively, the credit has been reduced your credit by 20% of your original installation value between 2010 and 2011. SB 177 plugs that gap by restoring that 20%, up to $400, when you file your Maryland state taxes. Although I've already taken my credit (though have yet to file), many people in Maryland are waiting for when they can buy an electric car, and 2011 is looking good here, so it's very likely if you're buying an EV in 2011, you'll want to install an EVSE in 2011. Thus, this credit should be quite popular this year. What's more, as I stated in a previous post, many people won't be able to declare the EVSE tax credit in 2011 if they buy an EV the same year. What's more, if one installs photovoltaics or other Residential energy credits, one could also easily face the AMT pitfall. Thus, for many people, this credit for one's Maryland taxes may be the only tax credit one sees for the purchase of an EVSE in 2011. As of this post, the bill is stuck in the Maryland Senate Budget and Taxation Committee since 26 January. Sending letters to both your state Senators and state Delegates will go a long way to moving this bill through the general assembly. The text of the bill can be found here. This open letter was written by Charlie Garlow and is provided as a sample for you to use, which I have modified slightly, to compose your own letter to your state Delegate, state Senator and Governor Martin O'Malley. You can find your Delegate and Senator here or simply call 1-800-492-7122. So show your support for making Maryland an EV friendlier state and write today! I am an electric vehicle owner and advocate and urge for your support for SB 179, which would establish a pilot program for residential electric vehicle charging, SB 176, which would set up a commission to improve Maryland's electric vehicle infrastructure and SB 177, which would enact an electric vehicle service equipment (EVSE) tax credit to supplement the credit reduced by the federal government in 2011 and would still be available when faced with the Alternative Minimum Tax elimination of the credit at the federal level. I ask for you to vote for these bills, sponsored by the Governor because it will promote clean, electric transportation in Maryland and will make Maryland a leader in new technologies, drawing more clean inductry and jobs to our state. You could save $200 or more by switching to one of Dominion Virginia Power's EV rates. That's the result I get from over a week pouring through the complexities of Dominion's rate structure. Of course, it's all contingent on Dominion's new EV Rate Proposal being accepted by the State Corporation Commission later this year. Why, in a Commonwealth, we call it the State Corporation Commission, I'm stymied, but I digress. Of course, that $200 is in addition to the $2,000 per year I could save by switching to an efficient EV since I estimate my annual petroleum fuel cost to be about $2,500. I drive about 75 miles per day and with fuel at $2.99 9⁄10 and consuming 16 gallons per week, the costs add up quickly. Compare this to an EV like the Nissan LEAF at only about $550 per year under current household electricity rates and you can see why I want to switch. But that's under Dominion Virginia Power's Residential Schedule 1 rate, with all riders, taxes and fuel accounted for. So why does this differ from my previous calculations of $300 or so under Schedule 1 where I deduced 7.033¢⁄kWh in the Summer and 4.187¢⁄kWh in the off-seasons? As you can see from the official filing, those rates are correct under that schedule. There's also the monthly distribution cost and the lower than 800 kWh rates, but I'm assuming those are taken up by my household's electricity costs. Unfortunately, I never go under 800 kWh in even the lowest power months. Yet I come up with a cost per kWh of 9.133¢, averaged over the entire year. Remember, the off-season rate is valid for twice as only as the Summer rate so if anything, my costs should be less than 7¢ for every kWh, not 2.1¢ more. In fact, if the cost were averaged over the entire year at those rates, the average cost per kWh would be just under 5.138¢, a nearly 4¢ difference. The Dominion Virginia Power electricity rate schedule is actually broken up into 6 to 7 sections: Distribution, Supply, Transmission, Fuel, Sales and Use Surcharge, Consumption Taxes and occasionally Local / County Taxes. Each of these are outlined below and then summarized. What this comes down to is that the distribution line item of your bill is the sum of these 4 parts, the first 2 coming from the Schedule 1 or related rate schedule above, and the second two coming from additional riders on your bill for the purposes specified in the rider. In the case of the Peak-Shaving rider, this comes out to 0.009¢⁄kWh, and for the Energy Efficiency rider, there's an additional 0.044¢⁄kWh. That makes a total of 0.053¢⁄kWh additional charges on your distribution. So, under Schedule 1, the total cost of all 3 riders is 0.265¢⁄kWh. The transmission costs of your bill come directly from Rider T: Transmission. The cost for electricity transmission is therefore given by 0.616¢⁄kWh. The cost of fuel for electricity generation is given by the Fuel Charge Rider A. As would be expected, the cost of fuel is rather volatile; in the last 10 years, it's changed 8 times, though it's been steadily decreasing since July 2008. As of this writing, it currently stands at 2.803¢⁄kWh. Thus, the cost of fuel is clearly the more than half of the additional 4¢ charge. The Sales and Use Surcharge is a tax on electricity usage levied by the Commonwealth. It's rated at 0.056¢⁄kWh. The consumption taxes are by far the most complicated part of the Dominion Virginia Power bill to calculate. First of all, this tax is actually made up of 3 different taxes: the State Consumption Tax, the Special Regulatory Tax and the Local Consumption Tax. What complicates things is that, like the Schedule 1 rates, there's a tiered basis to these taxes. If your total electricity usage in a given month is less than 2.5 MWh (remember, a Megawatt is 1,000 kilowatts), the tax summed over all 3 components comes in at 0.155¢⁄kWh. But, if you use more than 2.5 MWh, but less than 50 MWh, the summed rate reduces to 0.099¢⁄kWh for all electricity usage above 2.5 MWh. After 50 MWh, it goes even lower, but I doubt many homes are using 50 MWh in a month; I don't even use that much electricity in a year! As it happens, last year I dipped into the 2.5 MWh range during all 4 of the Summer months, a total of 122 days under the Schedule 1 definition (June, July, August and September). So in these months, my EV would have been taxed at the lower rate because of the large amount of electricity usage, but in the off-season months, it would be charged at the higher rate. If one averages the two rates out, based on 122 days of the year for the lower rate and the 243.2425 off-season days (in the Gregorian Calendar) I therefore pay about 0.136¢⁄kWh for the tax on average. Each county in Virginia has the option to apply an additional tax on top of the other taxes and surcharges. For instance, in Fairfax County, where I live, the tax rate is 0.605¢⁄kWh. The difference with the county tax is that there's a minimum charge of $0.56 which effects any total usage under 93 kWh. There is also a tax rate cap at $4.00, or about 661 kWh, so that there's no tax for any electricity usage above that limit. As all of my current household monthly loads are in excess of 661 kWh (and even of the 800 kWh of Schedule 1), I don't expect my EV would incur any additional Fairfax County tax since I'm already paying the $4.00 on the base load. In the name of fairness, however, I should point out that there's a 0.066¢ discrepancy between the average result above and this result. I assume this has to do with rounding errors because verifying against my internal calculations for each subsection, my numbers agree with those posted in the 7 sections above. In the second part of the Dominion Virginia Power Electric Vehicle rate proposal series, I'll be covering the details of the new Electric Vehicle rates and how they would effect a typical EV user like myself and what it's like to live under a Time-Of-Use rate. All that and more, coming soon! My friend Mindy is the proud owner of the first, number 1 of 250, absolutely fresh off the factory floor, before any other in all of the American Hemisphere, Smart For Two Electric Drive. She is the Gudy / Olivier (alt) of the East Coast and quite frankly my hero! Now, Mindy didn't create Azureus but like Olivier, who took ownership of the very first consumer-level production Nissan LEAF on 11 December 2010, Mindy signed the lease that would make history. At the Smart Dealership in Tyson's Corner, Virginia, Mindy braved the the nightmare Washington Snow Day of 26 January 2011 to attend an event featuring Penske Automotive Chairman Roger Penske And Smart USA President Jill Lajdziak. And as a show of the tremendous dedication of Mindy to the Electric Vehicle movement and the Electric Vehicle Association of Washington, can you guess what Mindy did after the ceremony? Well, sir, what she did was load that brand, spanking new first in the Hemisphere Smart Electric onto a truck and have it carted into Washington, D.C. for display at the Washington Auto Show! Now that's dedication! You really should visit us at the D.C. Auto Show where you can see Mindy's car and sometimes even Mindy in person at the EVA/DC display ( http://www.evadc.org/ ). You'll recognize us by the spider-translucent Tesla Roadster and the RAV 4 EV from the Wikipedia Page; but what I want to point out to you is the Solar Prius that our friend Bob Bruninga constructed right next to Mindy's Smart for Two EV. You see, the Solar Prius has a number of photovoltaic cells covering its entire top surface, including the hood. Now, solar cells have advanced in the years since he's done this but turning sunlight directly into electrical potential is a tricky business. So don't be surprised when I tell you that after 8 hours in the sun, Bob's Prius gets about 4 miles of additional range. You see, the surface area of a car is pretty small. Yes, a well-constructed vehicle could increase its surface area and lessen its weight to achieve much better range from sun, but to really get a car solar-powered, you're best off putting panels on the roof of your house and installing some large marine batteries to capture that energy during the day so you can feed your car from it while you sleep — or simply take advantage of Net Metering. Now, you may only get 4 miles per day from the solar panels, but that's 4 miles for free after the initial installation cost. It doesn't take a genius to see that those 4 free miles you get can really add up: 4 × 5 = 20 miles per week; 20 × 50 = 1000 miles per year, and in a 50 mpg Prius that translates to 20 gallons of fuel saved. At $3⁄gallon, that's about $60 per year you can save by adding panels; when fuel reaches $5⁄gallon, it's $100! So, can solar panels on the car get you to work, or the store or the mall? Probably not. But they can contribute to your overall savings, which is definitely good. As for generators in the axles, that's just Regenerative Breaking; the Smart Electric already has that. Now just to clarify, the Solar Prius gets about 1/2 per hour of sunlight, so at 8 hours of sunlight per day, that translates to 4 miles. Of course, the sun can shine more than 8 hours, so as usual, your mileage may vary. There's an interesting story from the Washington Auto Show Press Event on Thursday, 27 January 2011. I was watching over the Bob's Solar Prius when I spotted Victoria Riess of Planet Forward with her professional camera equipment taking video of the black car. Happy to help if she had any questions, I approached her and then agreed to an interview. Unfortunately, that was first time I'd ever seen the Solar Prius and didn't yet know much about Bob's amazing work! See, Bob is a physicist so you know whatever he did has got to be extremely clever; he also has a really fetching hat! In fact, Bob has a lovely placard on the side windows of his Solar Prius explaining how he did the work of creating this piece of engineering beauty. So, naturally, my interview was pretty bad, to say the least, and so don't be surprised if it never sees the light of day. 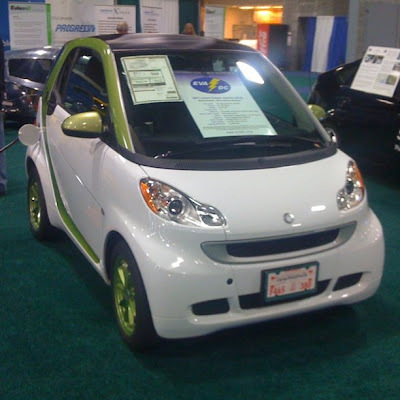 However, Mindy was there also, minding her number 1, first, extra special Smart Electric — one of only 3 at the show, apparently! 3 Smart Electrics but only one Nissan LEAF? The mind boggles, but there were other interesting cars there that I'll save for a later report… In any case, I suggested Victoria interview Mindy as a better candidate for Planet Forward since she's the Gudy of the Smart Electric community and, quite frankly, also my hero. Labels: D.C. Auto Show, Dealerships, EVA/DC, HOA, Net Metering, Nissan Leaf, Regenerative Breaking, Smart EV, Snow, Tesla Roadster, Toyota Prius, Toyota Rav4 EV 2002, Virginia, Washington D.C.